The Design Trust is helping artists market their work through identifying and finding their real audience. The Little Globe Co is the product of two years' painstaking development and refinement for ceramic artist Loraine Rutt. 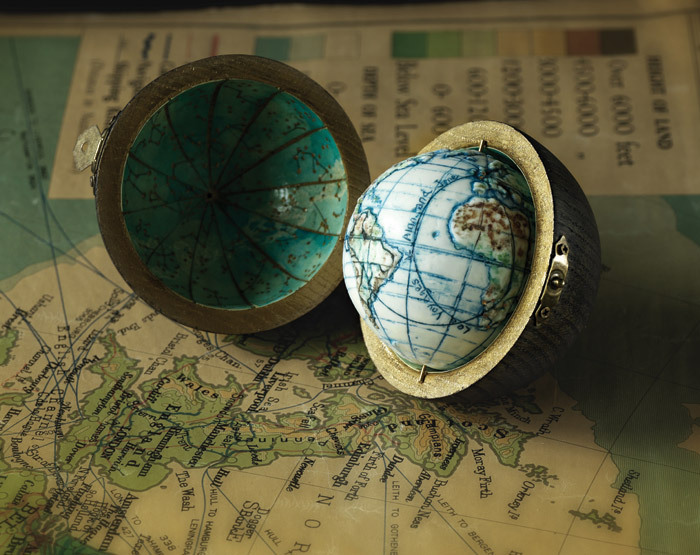 Built around a range of six miniature globes, inspired by the original 18th-century 'Gentleman's Novelties', it renders in exquisite porcelain relief and delicate paintwork the wonders of our planet or its lunar companion. To hold one is to feel afresh the fragility of our planet, and how precarious, troubled and yet magical is our existence on its surface. Rutt trained as a cartographer and worked at Birkbeck, but quit mapping when digital tools started removing the input of eye and hand. She switched to ceramics, studying at Central Saint Martins under some of the UK's finest ceramic artists, including Richard Slee, Gillian Lowndes, Ruth Dupré and Rob Kesseler. After graduating, she won a Churchill Memorial Trust Travelling Fellowship, and journeyed across Spain, the USA and Mexico, investigating architectural ceramic styles and finding inspiration for a whole new body of work -- which sold out at the resulting show. But although she has been making cartographically inspired work for more than 25 years, it is hard as an artist to keep the momentum going, and making has occasionally taken a back seat to teaching and inspired (but time consuming) house renovations. However, a spell of enforced postoperative downtime in 2013 gave Rutt the mental space and momentum she needed to engage with the idea that the blend of creativity, project management and budgeting skills she so patently demonstrated on her house renovations could assist in her artistic practice too. Assistance for her mission came from several sources, including Patricia van den Akker's online business school, The Design Trust, aimed at supporting artists, designers and makers. Says Rutt: 'I spoke to Patricia in a webinar. She really helped me focus and think about where my market is. And the other influential thing was a book I read -- more for the product-design intelligence than anything -- a brilliant book by Fiona Humberstone called How to Style your Brand. I would recommend it to every artist. In this respect, Rutt is one of the lucky mid-career artists, says van den Akker, having already realised she could be entrepreneurial. She says: 'People come to me at three years, seven years, 20 years. They have very specific questions at those stages. At 20 years, they are established designers/makers. They have a good name, a good profile, but maybe not a good income to go with it. The main reason for that is they may have relied on the galleries to sell their work. That scene has changed dramatically -- that whole way of selling craft. As an example, van den Akker cites a graduate who came up to her at her workshop during New Designers in Business (an annual showcase in Islington for some of the most promising art and design-course graduates). He was struggling with his marketing, he said, showing her a picture of a huge oak table that took him six months to make, and which would have to be priced at around £12,000. 'So we went through the questions about who would be interested in paying that? They would very likely have a kitchen extension, they would love entertaining. A table like this would be the cherry on the cake of feeling very rich, very lucky or enjoying their good fortune. As for Rutt, she realised that small-batch slip-casting could speed up the first part of the making, allowing her to spend time on the fun part -- scribing the craters, the mountain ranges, the coastlines and then painting and customising each globe. She also decided that her typical customer would want the presentation to be every bit as exquisite and artisanal as the creations inside. She found a British maker to create cases out of hand-turned, wind-felled oak, and another who could hand-tool them in leather. She then hand-painted maps and astral charts on the interiors and gilded the apertures to create the most treasurable version of the globe possible. It would seem appropriate to wish this entrepreneurial artist bon voyage.